One of the most common resistances I hear when clients or friends tell me that they want to learn intuitive and mindful eating is that they don’t have time to devote to it or the patience to make it happen consistently. Because we live in an never-ending loop of stimuli, action, rest, repeat, where the action takes precedence over the receiving and the output is valued over the input. How can we possibly slow down, create space and time to just eat when there is so much that needs to get done in a day. Heck, even I fall prey to the endless distractions, shiny objects and allure of multitasking for fear of FOMO or worse….being left behind. I can feel my restlessness and impatience coursing through me when I try to slow down to eat. After all these years, it still takes practice to quiet myself and give myself permission just to eat, to nourish without distraction. You truly don’t feel like you have the wherewithal to learn this and do this. But, unlike so many endeavors of your past where you have thought in black and white about your perceived successes, this one has no parameters and no deadlines. It doesn’t have a beginning, middle or end. And it definitely doesn’t have a perfection principal. All mindful eating asks of you is to drop in to your body, and the eating experience. To agree to stay present and aware and to detach from the stories and judgements you have about food, about your body and about your appetite. It’s not easy but it is simple. … “instead of saying you don’t have time, try saying ‘it’s not a priority’ and see how that feels”..
Because, the truth is, we DO have time. We just are not making it a priority. Why should you make it a priority? decreased stress hormones that wreak havoc on our gut health, metabolism and digestion and assimilation of nutrients. So, if one of your main concerns in learning to tackle mindful eating is time, try these very simple techniques and strategies to help you move pasts the common blocks and resistances. 1. Ask yourself: Do I really not have time, or am I just not making it a priority? 2. Start simple: Have only 1 mindful meal or snack per week to start and commit fully to it. 3. Start simply by just doubling the amount of times you chew per bite. 4. Start by just removing obvious distractions: not driving and eating, not watching TV and eating, not eating standing up and multitasking while eating. 5. Do a time audit. 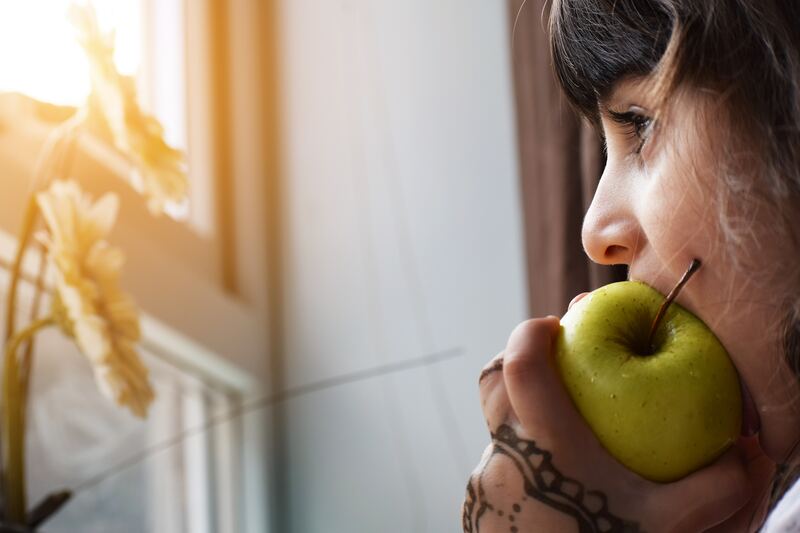 Determine how much time you spend on non-essential things like internet time, online shopping, TV time and the like and reclaim just a ½ hour of that time to devote to practicing mindful meals. 6. Take my free mindful eating course to learn more about simple steps you can take today to practice intuitive and mindful eating. The journey to reconnect with your own joyful relationship with food and body starts by turning inward and reclaiming that special ability that each and every one of us has to nourish ourselves in a balanced and effortless way. Time is a construct that is malleable and changes based on our priorities and perceptions. Many of us are so outcome-based instead of process-based, that we won’t even try unless we feel we can give it 100%. Don’t let perfectionism and black-and- white thinking prevent you from peering out into the vista of mindful eating which can literally change your whole relationship with food and body. 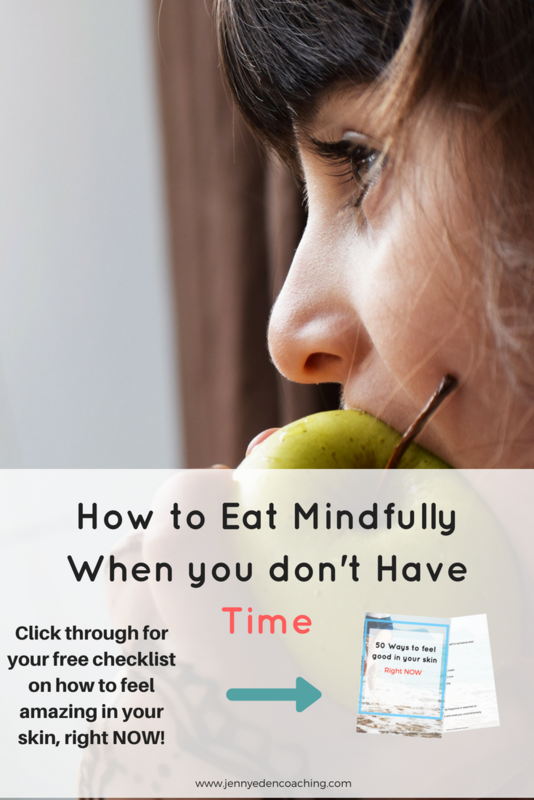 Tell me: Have you given up on learning mindful eating due to perceived lack of time? What are some other blocks, challenges and resistances you’ve come across? Food Shaming: Don’t Yuck my Yum! But, I DESERVE that brownie!